[Christian] is learning to use the metal milling tools at what we assume is his local Hackerspace. We love this about the communal spaces, they provide so many opportunities to delve into new fields. He embarked on a voyage that included visits to most of the machinery in the shop as he build his own carabiner with a magnetic gate. He’s not going to be hanging off the side of a mountain from it. But his keys or a water bottle will find a happy home thanks to the device. It all started with some sketches to establish the shape of the overall design. From there he spent some time modelling the frame of the carabiner in CAD. He’s lucky enough to have access to a water jet which took the SolidWorks files and cut out the aluminum frame for him. That left a part with very sharp edges, so he used a wood router with a carbide bit to round them over. The next part is adding the gate. He used an end-mill to add a mounting area on the frame. The locking ring for the gate was textured using a knurling tool, and the rest is milled with a simple cutting tool. This gate uses a magnet to center itself, with the knurled ring as the only mechanical latching mechanism. 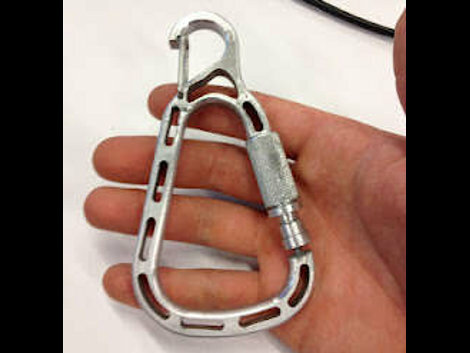 [Christian] does a good job of demonstrating the completed carabiner in the clip after the break. 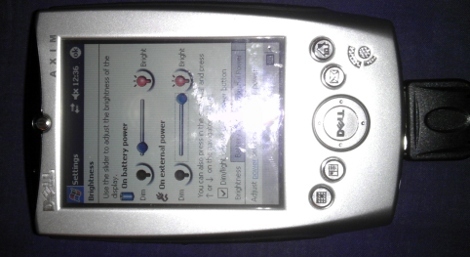 [Troy Wright] acquired a lot of twenty broken Dell Axim PDAs. This type hardware was quite popular a decade ago, but looks archaic when compared to a modern cell phone. That’s why he was able to get them for a song. After a bit of work he managed to resurrect eight of the units, but was dismayed to find there’s no published method for controlling the back light from software. For some reason this is a deal-breaker for his project. But he knew it was possible because there are some apps for the device which are able to set the back light level. So he found out how to do it by reverse engineering the software. The trick is to get a hold of the code. Since it’s not open source [Troy] used IDA, a graphical disassember and debug suite. He had some idea of what he was hunting for as the Windows CE developer documentation does mention a way to directly control the graphical hardware independently from the display driver. A few hours of pawing through assembly language, setting break points, and testing eventually led him to the solution. At Hack a Day, we’ve seen dozens of intervalometer builds that open and close a camera shutter remotely. [Luke Skaff] decided to take these builds to the next level by automating a camera’s focus and shutter with a Nintendo DS. [Luke]’s build is based on the Open Camera Controller project that puts the power of an intervalometer, sound trigger, sequencer, and HDR bracket shooting into the hands of professional photogaphers. 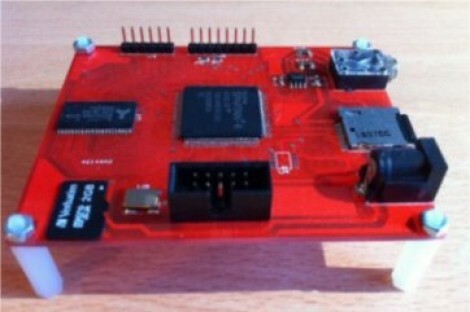 The Open Camera Controller is built to run on a Nintendo DS with an AVR-based card attached to the Game Boy Advance cartridge port. The Open Camera Controller attaches to a camera’s shutter port, but [Luke] stepped things up a little bit by using a USB host controller and implementing the picture transfer protocol. Now, instead of [Luke]’s controller telling his camera when to open and close the shutter, the focus of the camera can be adjusted as well. [Luke]’s build uses an Xilinx CoolRunner-II CPLD and a USB host controller to convert the DS cartridge port to a USB port every DSLR can connect to. [Luke] still has a mess of wires on his hand, but even we can see the power that inexpensive automation would bring to the world of digital photography. Several of us here at Hackaday Brew our own beer. Needless to say, we got a little excited when we saw members of the open source community building a brew tracking system. Brewtarget is an open source tracking system that you could download right now and begin tracking and building your recipes. It looks like there is a fairly active development group working on it and even a feature request form that seems to be filling up. Maybe we overlooked it, but there doesn’t seem to be an existing feature list. We look forward to seeing where this project goes. Brewtarget implements BeerXML, which means it should also be compatible with Beershmith, a commercial application. Right after “no editing whatsoever”, the “shaky camera” is the bane of YouTube viewers the world over. [David] came up with a nice solution to the problem of shaky cameras that uses gyroscopes to even out the bumps of making a great movie. Most cameras attached to moving frames – from the zip-line cameras at NFL games to police helicopters and aerial reconnaissance drones – have some sort of gyroscopic stabilization. Even though gyroscopic stabilization has been around for more than 60 years, the designs haven’t changed that much. [David] dug up a few patents dating from the 50s and set to work replicating the design. [David] bought a pair of [Glenn Turner]’s fabulously heavy and expensive-looking powered gyroscopes and began bolting them onto a piece of sheet metal. Per the 1950 patent, the gyroscopes were mounted 90 degrees apart and bolted onto the camera. From the video demo (after the break), there’s a marked difference between filming a stroll though a parking lot with the gyros on and gyros off. While the pair of motor driven gyroscopes look a little ungainly and are a bit too loud for our tastes, the solution is much less expensive than the $1600 professional gyro [David] based his build on.